Sometimes you become so intrigued by a story that you just have to shove aside frugality for the moment and just buy the book. 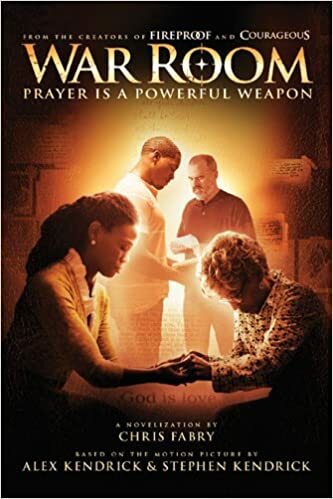 That's the way the War Room: Prayer is a Powerful Weapon was for me. I kept seeing my friends posts on Facebook about this story and decided it's was worth seeing what all the fuss was about. Once I started reading I just couldn't put this book down, staying up most of the night finishing it. The riveting story itself was a page turner. "But it's Clara's secret prayer room" that kept me thinking and getting excited for more prayer in my own life. This book made me want a War Room of my own. I can't imagine a vacant spot for a prayer room in my home but I'm considering clearing something out! Both Elizabeth and Clara are such great characters in this book. Clara with her calling to help someone and Elizabeth with her willingness to change. I felt myself totally immersed in this story as it unfolded (I'm still making up the sleep). The turmoil, the tears, the calling out to God, and the joy are all described so well, I felt as though as I right there fighting the battle with them. The impression this story left with me has stayed for days. This was a definite must read!